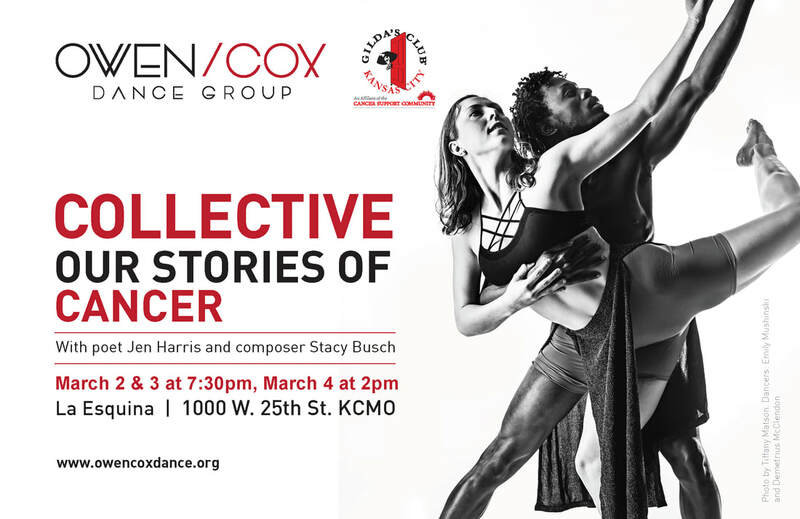 Gilda’s Club Kansas City will be collaborating with Owen/Cox Dance Group, Charlotte Street Foundation, poet Jen Harris (founder of KC Poetry Slam), and composer Stacy Busch for a multi-disciplinary production of Collective: Our Stories of Cancer. This evening-length work will provide a deep and insightful experience into life with cancer. The performance will feature original choreography by Jennifer Owen, music by Stacy Busch, and poetry by Jen Harris, inspired by members of Gilda’s Club who shared their stories of cancer. The work will be performed by Jen Harris, Stacy Busch, soprano Liz Pearse, and five dancers of Owen/Cox Dance Group. Dancers include Megan Buckley, Felicia McBride, Emily Mushinski, Logan Pachciarz, and Christopher Page-Sanders. Performances will be held March 2-4, 2018 at La Esquina Gallery, Charlotte Street Foundation’s performance space in Kansas City’s historic Westside. Performances on March 2 and 3 begin at 7:30 PM, with a matinee performance taking place on March 4 at 2:00 PM. Tickets may be purchased by going to owencoxdance.org/. In 2018, Gilda’s Club Kansas City is hoping to raise awareness of the incidence of cancer in the local community and the positive benefits of education, support and self-advocacy. A new way of raising awareness has been brought to the fold through the multi-disciplinary production Collective: Our Stories of Cancer. Art connects people in a special and intimate way. Collective is a production that seeks to capitalize on that, celebrating those impacted by cancer, serving to unite those who have or are currently experiencing cancer, while embracing diversity and instilling hope. Stacy Busch is a multimedia artist and performer. Her collaborative concert experiences are designed to be provocative and accessible in order to re-cultivate broader artistic interest and, in particular, reach under-served and misrepresented communities. Stacy is the founder and president of No Divide KC, an arts and social justice non-profit that creates artistic events for various social causes. Artistically, her work deals with internal conflicts that are often taken abstractly from her personal experiences with drug and alcohol addiction and bipolar disorder. These experiences in duality both in the mind and body she finds universal. The underlying human vulnerability in her performance and work is unifying when experienced together. Poet Jen Harris is a professional public speaker, spoken word poet, activist, published author, founder and former host of Kansas City Poetry Slam. Nationally recognized in the aforementioned, she works as an advocate to incorporate spoken word poetry as a form of peer-based mental health therapy. Harris recently completed a year-long writing residency through Charlotte Street Foundation in Kansas City, moved to Denver, is finalizing two books; Lust & Disdain & Unconfirmed Certainties, was featured at Write About Now, Button Poetry, and presented at TEDxKU on Sept 30, 2017. Jennifer Owen is Artistic Director of Owen/Cox Dance Group, an ensemble she co-founded with composer Brad Cox in 2007. She has choreographed over fifty new works for Owen/Cox Dance Group, including two commissions by the Nelson-Atkins Museum of Art, and works commissioned by Island Moving Co. of Newport, RI, Kansas City Dance Festival, Kansas City Baroque Consortium, and Kansas City Chamber Orchestra. She has also created nine new works for Kansas City Ballet’s In the Wings choreographic workshop, and a winning entry for the 2006 Columbus Choreography Project. Owen is the recipient of a 2000 Princess Grace Honorarium. Prior to founding Owen/Cox Dance Group, Owen enjoyed a 13-year international ballet career. After training with Pacific Northwest Ballet School, San Francisco Ballet School, School of American Ballet, and the Bolshoi Ballet Academy, she went on to dance with the Russian State Ballet, Moscow Renaissance Ballet, Kansas City Ballet, Hong Kong Ballet, BalletMet, and was a guest artist with the National Ballet of Turkmenistan.